We all are, actually. One of life’s greatest mysteries is when this will happen and how, but we try not to dwell on it because life is about living and all of the joys and sorrows that come from the journey. Unfortunately, events like the Boston Marathon bombings prove that life is much more fragile than we often realize in our day-to-day consciousness. In just a matter of moments, we can vanish simply because we were in the wrong place at the wrong time. A thought that makes me, a 21-year-old who has a miles-long bucket list, not want to leave my brown leather couch and go out into the world. It’s also one that makes me feel incredibly far from home and vulnerable at this time when I’m living in a big city. These events that put our lives into perspective seem to happen far too often. 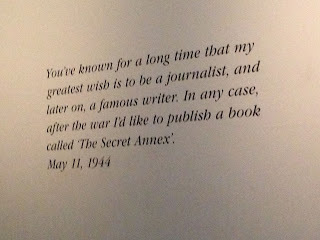 A few weekends ago, I went to the Anne Frank museum and was more affected by the visit than I ever expected I would be. Now, looking back, the visit seems to fall right in line with the tragic events that have been happening. I also think it can tell us a lot about patterns of human nature. I read Anne’s diary a long time ago and distinctly remember certain passages, even though I only read it once. Her diary is a profound insight into the way Jews were treated during the Holocaust, and is made all the more horrifying by the fact that she was just 13 when she started writing it. Anne’s family moved to Amsterdam after the Nazis took control of Germany, so she lived there since she was a toddler. The museum is located in their Amsterdam home, which is the one they hid in, and ultimately, the one they were discovered in. The self-guided tour takes you through every room in the house. Anne’s father, Otto, and the museum committee made the decision to leave all of the rooms bare. The effect is intended to remind visitors how the Nazis took everything, from furniture to memories, from the people in the Holocaust. The set-up works. It works too well. I felt chills the entire time I walked through. The white walls have quotes from Anne’s diary painted on them, but are otherwise blank and vacant. One notable exception is the pictures of Hollywood stars that Anne tacked up in her bedroom, which are left as if she just pinned them. The secret bookcase door also remains. Over time, she became a serious, anxious and depressed teenager with one simple wish: to go outside. As visitors walk through the secret annex, they can stare at the black curtains that blocked the only windows in the rooms. The space is dark, the mood somber. In her diary, Anne discusses how she and her family had to “tread lightly” during the day so the workers in her father’s factory wouldn’t know that people were hiding upstairs. As I went through, I too, tried to walk softly. The room that was most difficult to be in was the room they were discovered in. How could Anne have known that when she walked into the annex, she would never be free again? The thought of Nazi boots stomping on the floorboards and the unforgiving soldiers dragging the Frank family out of the very room I was standing in broke my heart. 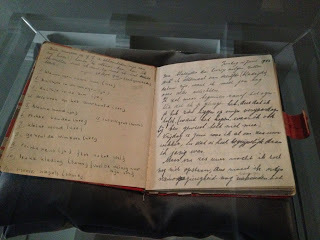 The checkered diary Anne received when she was 13 is the last item in the museum. It is her legacy. It is undoubtedly made powerful because the teenaged Anne describes her feelings in a mature and eloquent way. I could feel the pain from the pages while I was in the room. It’s a feeling that will stay with me both as a writer and as a human. Maybe these tragedies feel more real because I’m so far from home. I can’t imagine any wide-scale trauma happening and never seeing my family again without a word. That exact scenario happened to millions upon millions of people. Even now, the news of the bombings leaves me feeling saddened and vulnerable at the sudden, unexpected loss of life. Anne’s death, which we can all agree happened far too early, is another eerie reminder that nothing is certain. The bombings, too, are terrifying signs of tragedy at the hands of other humans. But both can remind of us how much good there still is. 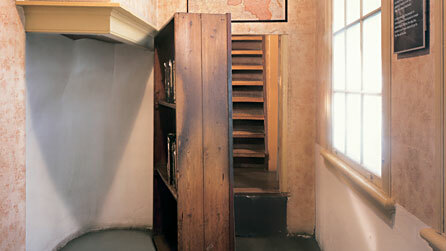 For as much as the Anne Frank museum disclosed about the trauma of the Holocaust, it also showed how many people went out of their way to keep Anne and her family in hiding. Otto’s factory staff grocery shopped for the family, bought them magazines and books, and defended the Franks until the last minute. Even in the concentration camps, Anne’s more fortunate friends snuck her extra food rations and risked their lives to come talk to her. Recently, we’ve all been encouraged by the stories of runners who kept jogging after they completed grueling 26-mile races to donate blood to the victims. We’ve seen the number of people who opened their homes to others, and are inspired by those who ran into, instead of away from, the smoke. Tragedy is in human history. But if Anne’s story can teach us anything right now, it’s that the heart of life is good. We might be changed irreparably when these events occur, but we will carry an appreciation for our existence with us as we continue. We know that humans will rise up in the face of tragedy. Good people outnumber the bad. And life will go on. So yes, we will die. And no, we most likely will not know when. But that’s better. There’s still reason to leave the couch. This is a privilege we have that Anne never did. And there’s still reason to keep moving.